STORM COOKING: (MEATLESS) SOUP BEANS | Jane Lear. Writing on Food and Travel. It’s the day after Hurricane Sandy walloped New York, and Sam and I are among the fortunate—we are sitting high and dry, with the lights on. I’ve just sheathed the Maglites and the hand-crank weather radio (complete with cell-phone charger) in zip-top bags and stowed them back in the emergency box. Sam watched me without comment; after looking at the coverage of all the hell that broke loose last night, he’s no longer so quick to dismiss my near-obsession with disaster preparedness. I came by it honestly. 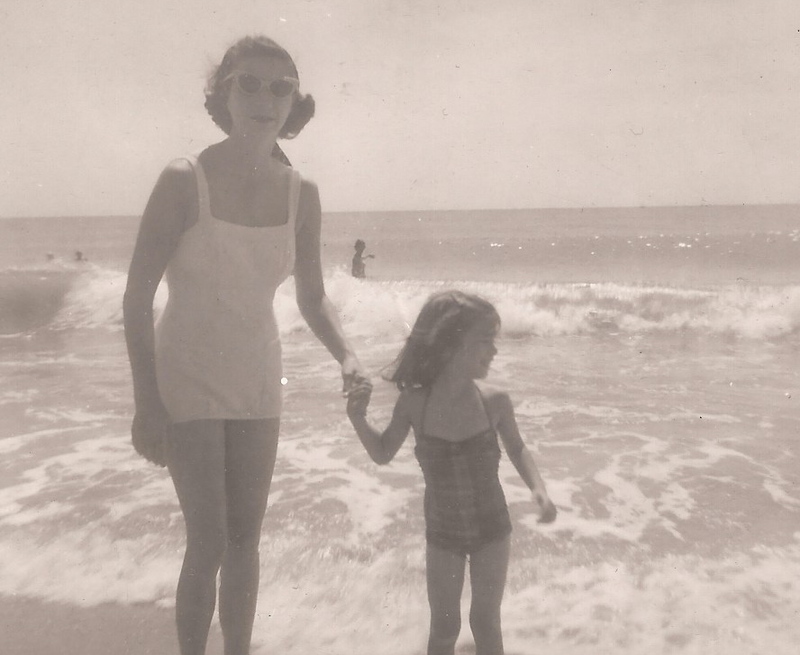 Hurricanes Hazel and Connie-and-Diane (hyphenated and always mentioned in the same breath because they hit North Carolina within five days of each other) wreaked their havoc a few years before I was born, but they remained fresh in the minds of my parents. By the time I was six or so, I was practiced at helping my mother update what she called her emergency larder, located on the top shelf of the pantry. At least once a year, we would make sure there were boxes of safety matches and spare wicks for the hurricane oil lamps; fresh jugs of distilled water; and containers of fresh flour, cornmeal, salt, and sugar tightly wrapped in multiple layers of plastic. Alongside the small pots of Vienna sausages and deviled ham, there was a supply of canned nonperishables, their contents marked on the top with an indelible marker, in case the paper labels got wet and disintegrated. This stock-taking always took place before hurricane season, weeks before any coastal warning display flags appeared. I never knew what precipitated it; perhaps the sky was a little too bright, the ocean, a little too glittery. Anyhow, my mother, expert at sizing up things that were too good to be true, always wanted to be ready for anything. Her emergency rations included cans of Luck’s pinto beans, and for some reason, I found them especially fascinating—I guess because I don’t recall my mother ever cooking or serving pintos. She adored butter beans, snap beans, and all manner of fieldpeas—from delicate lady peas to earthier, almost mushroomy black-eyes—and that was what we ate. Looking back, I have no idea why pinto beans were among her inventory—they were likely on sale at the time. I just remember wishing for a hurricane to hurry along so I could try them. A big enough storm eventually obliged, and those canned pintos were just as delicious as I expected them to be. I’ve loved them ever since. It’s impossible to imagine the cooking of Mexico and the American Southwest without pinto beans, but for me they are most closely identified with the cooking of Appalachia. All through the mountain South, in fact, pinto beans are what people mean when they refer to “soup beans,” served in their rich broth with hot cornbread and a slice of fresh onion on the side. The preferred seasoning meat when cooking soup beans is salt pork; those made with a ham hock taste, well, ham-handed in comparison. That is why pinto beans fell out of my bean-cooking repertoire. Until, that is, Hurricane Sandy started to get serious and I found myself yearning for a taste out of that emergency larder … except better. Coincidentally, I discovered a recipe for meatless soup beans in Butter Beans to Blackberries: Recipes from the Southern Garden, by my great pal Ronni Lundy, self-styled writer, rocker, and cornbread fundamentalist. I thought I knew the book well, but like all classics, it rewards you with something new every time you pick it up. Ronni credits Sheila Joyce Strunk for this recipe. Growing up near Berea, Kentucky, Sheila had always cooked her soup beans the traditional way. But when she and her husband got into the Louisville restaurant/club business, some of their customers requested a meatless version, and she gives hers roundness and depth of flavor with good olive oil, along with onion, garlic, thyme, and marjoram. 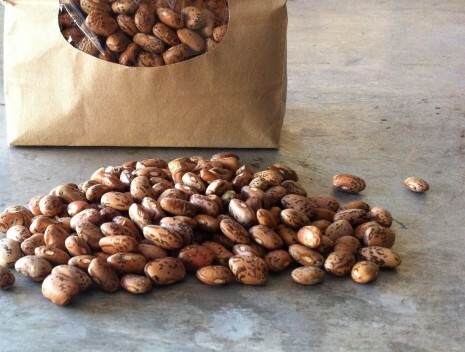 You can always soak your beans overnight beforehand, but this recipe uses a quick-soak method that works like a charm. No matter what, the freshest possible dried beans will deliver the best flavor and creamiest texture. I bought mine from Cayuga Pure Organics, at (where else?) the Union Square Greenmarket, but no worries—just buy your supply at a store that has a high turnover, and you’ll be fine. So last night, we moved the dining table away from the windows, which had begun to flex in the sustained gusts powering down our street. I ladled soup beans into thick earthenware bowls and set them on wide plates, with room enough for a wedge of Ronni’s Real Cornbread, and we ate by candlelight. We have plenty left, so we can easily feed a hot meal to friends who are coping with power outages and flooded basements. But maybe I should get another pot of soup beans working on the stove. It would be nice to have a batch in the freezer. Just in case. 1. Rinse the beans and pick through them, discarding any stones. Place the beans in a large, heavy soup pot and cover with water above 2 inches above the beans. On high heat, bring to a boil and boil, uncovered, for 10 minutes. Turn off the heat and let the beans soak for 1 hour. 2. Add more water to the pot, if necessary, to bring the level about an inch above the beans. Add the olive oil. Bring to a boil, cover, and turn the heat to medium-low. Simmer for 1 hour. 4. Remove about ½ cup of beans and mash them to a thick paste. Return them to the pot and stir to incorporate. Add the garlic, marjoram, and thyme. Add salt, starting with 1 teaspoon and increasing to your taste. Allow the beans to simmer over very low heat for another 20 minutes to let the salt seep in. Fish out the herb sprigs if you used them. Serve piping hot with Real Cornbread (see above) and white onion slices or a green onion on the side. So glad you are safe! I love this recipe and have beans already soaking.